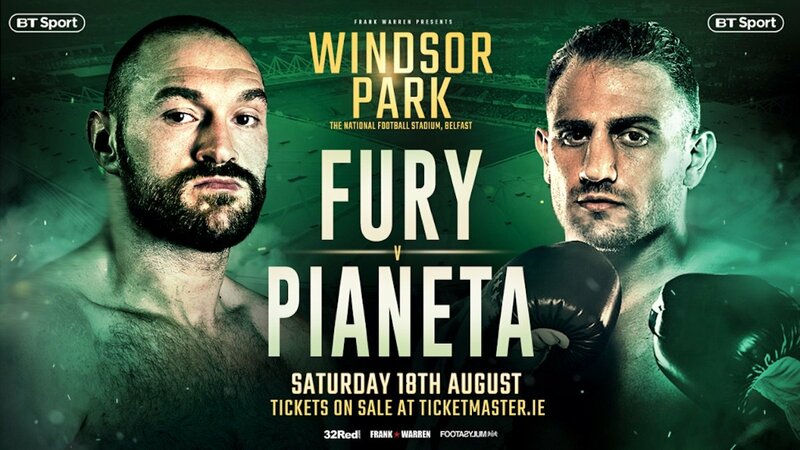 Lineal world heavyweight champion Tyson Fury will take on former European champion and two-time world title challenger Francesco Pianeta at Windsor Park on August 18. Fury (26-0-KO19) returned from two-and-a-half years out of the ring with a dominant stoppage of Sefer Seferi in Manchester on June 9 and will continue his march back towards the top against Pianeta (35-4-1-KO21). Pianeta, who won the WBC world youth crown before picking up EBU and WBO European titles, has twice challenged for world honours – losing to Wladimir Klitschko in 2013 and to Ruslan Chagaev two years later. Fury v Pianeta is added to a colossal stadium show that also includes Carl Frampton v Luke Jackson, Cristofer Rosales v Paddy Barnes for the WBC world flyweight title, Luke Keeler, Lewis Crocker, Marco McCullough and more.